How To Use The Map: To see what the map has in store, just run your mouse over the place names. If you'd like to see more, click on the link. Whether or not you choose to read the essay below, it is well worth reading at least the first paragraph, as it explains the overall concept of the layers in this site. 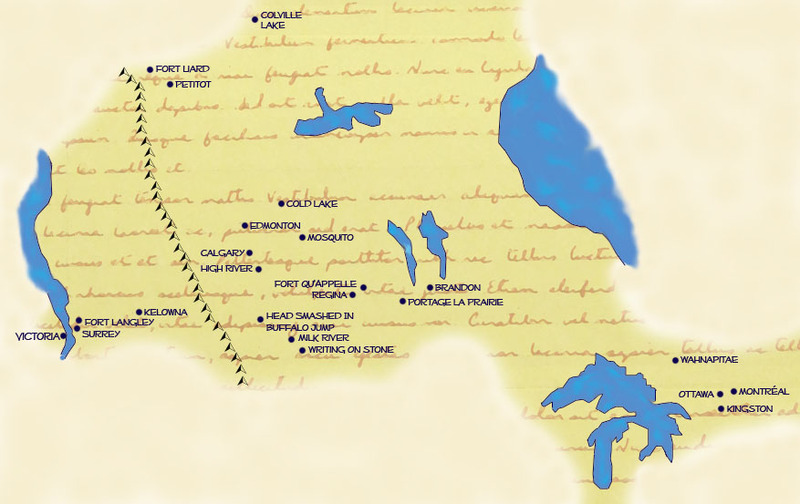 Starting Points: Compared to First Nations who were already here, non-Natives who came to Turtle Island to colonize it, and non-Natives who came to North America to escape where they came from, Métis see the land quite differently. Métis didn't and don't start from a remembered image of somewhere else that they are trying to make this land fit, whatever it takes analogous to the gory original version of Cinderella*. Nor did or do Métis start from a remembered image of somewhere else they hope to escape. Instead, Métis tend to see the land as a place of interleaved layers. Other Métis scholars have made use of this layering metaphor which I make no claim to have discovered or invented. Recent examples include Brenda MacDougall in her book One Of The Family1 and Carol Leclair in her thesis on Métis Environmental Knowledge2. One of its happy features is that it does not demand the exclusion or erasure of native or non-native elements. It even allows the conceptualization of an anti-layer, the racist structures and beliefs that can render the other layers difficult to access or interpret. However, this metaphor is not without risk. It is important to fight the urge to rank the layers, and to bear in mind that these layers are not sealed off from one another. The layers are integrated with each other by memory, story, and family. The early Métis needed to learn how to live in a full land, and its currency was and is in relationships. As MacDougall notes in the case of the Métis of Sakitawak, "Métis family structures are rooted in those of First Nations ancestors whose worldview privileges relatedness to and between land, people, spirits, and other living creatures"3. Ancestors live in particular places, calling them by specific names that they pass on to their descendants. Through these named and remembered places, Indigenous peoples remember and tie together past, present, and future, to partially paraphrase MacDougall4 as well as Keith Basso in his study of the Cibicue Apache5. The vehicle of these ties is not just passive memory or family interconnections. More importantly the vehicle includes a demand for active remembering and expression through stories and visits to the places. There are striking similarities between the practices of Sakitawak Métis, the Western Apache of Cibucue, and the practices of my own family who have relationships to, but a separate origin from, the Sakitawak Métis. For my part, I grew up in a Métis family where these ties have not been shared or renewed with me. The stories have not been retold; even the word "Métis" was effectively verboten. Since my childhood, there have been important changes in other branches of my family that have opened up access to those stories and allowed me to learn my immediate family's past, which is how I could make the comparison to the Sakitawak Métis above. My family experience may or not be unique in detail (I fear it isn't unique at all). However, my need to engage in a process to become an actor of my own Métis identity as opposed to a passive recipient of the negative consequences of the racism I experience as a Métis is something that is shared with other Native people in general. It is a powerful, shared Indigenous experience, although not all of us survive it. Overcoming the anti-layer of silence and deleted information. Seeking out information, any information on Métis in Canada. Overcoming acquired Red River myopia. Learning about Métis origins and my family's genealogy. Shifting from a sense of overwhelming loss to a realization of survival and gain from sorting these things out. Disentangling my own understanding and sense of my identity from the pervasive mainstream anxiety about perceived "pernicious Métisness." True to the interleaved, concurrent layers mentioned above, these elements are not exclusive or in order. Unidentified anti-layer stuff does still come up, luckily less and less often. Every now and again I can't set down a self-proclaimed source on Métis history or people that is part of the anti-layer because it's like a gruesome train wreck. These elements are not unique to my own experience, either. They are observable in the writings and storytelling of Métis Elders, scholars, and organizations. Practically speaking, I couldn't bootstrap myself into this process, and my own family was not in a position to help me at the beginning. So I turned to the one thing I knew as constant, the land. Going for a long hike and going to visit familiar, pleasant places has been a key means of survival for me because home was often an unfriendly place to be. Through the land I was able to access the stories, all the more important to me as a writer. It also helped provide a structure for what might otherwise have been an unhelpful, chaotic mess of information. The places shown on the map are those where I experienced key events so far in this process. Living or occurring at the same time. A person living at the same time as another. A person of roughly the same age as another. If Métis experience the land as a palimpsest, the land must experience people in the same way and to an even greater degree. As far as the land is concerned, my own visit to a place, and a visit to that place by the first Métis who ever emerged or the first Métis who ever made it to that place happened practically at the same time. Why, your visit there tomorrow would put you there in the middle of a crowd, and the land must be wondering how we can be so oblivious to one another. We practically walk on each other's heels, talk all at the same time and walk through and past each other. The sense of "being at the same time" is a theme I have noticed among Métis I know personally and Métis authors. I have often heard other Métis tell stories of their ancestors as it if was happening right now, right here, while we listen and watch, and it was another Métis woman* who pointed out that I do the same thing myself, all unconsciously until that moment. Many Métis authors I have read seem to be writing in what anthropologists like to call the "ethnographic present," which allows a bit of Métis storytelling contraband into both non-fiction and fiction works. One of my favourite examples of this storytelling mode is in the original version of "The Origin Of Grey Ducks" transcribed from Marie-Louise Perron's Telling in Volume II of Métis Legacy6. The four overtly designated layers of this website are each marked by their central feature, a map with acknowledged and discussed distortions. They are the Travel, Place, Métis Trail, and Story layers  and if you let them, they will take you places.